PARTNER POST – Get creative with any of Castello’s uniquely crafted cheeses. Click here for a $1 off coupon to create your own gourmet masterpiece. When it comes to using cheese in desserts, my mind usually goes straight to varieties like cream cheese or mascarpone. 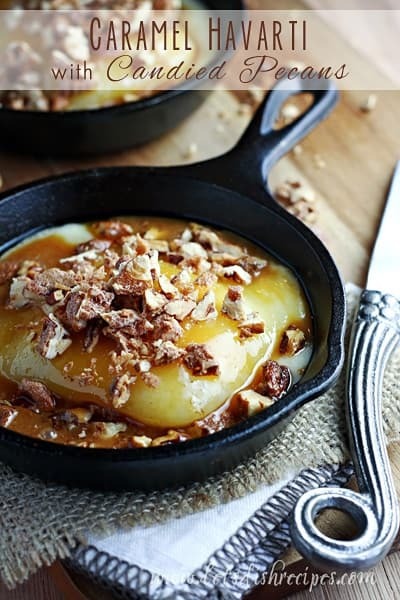 But when it comes to incorporating cheese into your desserts it pays to think outside the box, because you might come up with something amazing, like Caramel Havarti with Candied Pecans. Served with some tart apple wedges, it’s the kind of dessert your friends and family will be talking about long after it’s gone. I used Castello Creamy Havarti cheese in this recipe. It has a soft, creamy texture and mild flavor, which made it a perfect vehicle for the caramel sauce and candied pecans. Plus, it melts beautifully, which makes for a great presentation. Castello Creamy Havarti is also a great addition to a cheese board, since it’s easy to slice and goes well with fresh bread or fruit. And it makes for an amazing grilled cheese sandwich! 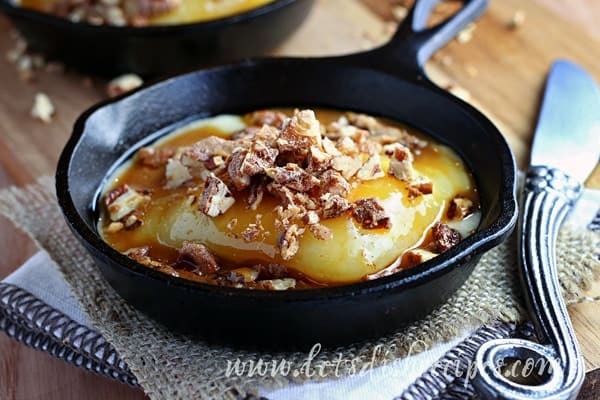 It probably won’t come as a surprise to hear that my kids were a bit reluctant when I told them about my plans for melted cheese topped with caramel and pecans. But after one bite, their reluctance vanished. In fact, the entire dish disappeared in less than 10 minutes! That’s how much we loved it. I highly recommend serving this dish with Granny Smith apples, but any tart variety will work. I divided the recipe between two small cast iron skillets, but feel free to use a single baking dish. In addition to the fabulous combination of flavors, this dessert is incredibly easy to prepare. I love it when food is simple, but looks and tastes fancy! The candied pecans take about 30 minutes to make, but they’re not difficult, and so worth it! You’ll have some extra candied pecans, because it’s hard to make a smaller batch than what the recipe calls for, but trust me, you won’t mind the leftovers. Save them for topping ice cream, or do what I do…..just eat them! To make the candied pecans, combine the egg white and water in a medium bowl. Whisk vigorously until frothy. Stir in vanilla. Add sugars, cinnamon and salt and mix well. Stir in pecans and toss to coat evenly. Spread pecan mixture in an even layer on a parchment lined baking sheet. Bake for 25-30 minutes, or until golden brown and bubbly. The egg mixture will look frothy and soupy when you remove it from the oven. Cool completely. Break the pecans apart and set aside. Turn oven to 375 degrees. Lightly grease a small baking dish. Cut the Havarti cheese in half to form two smaller blocks of cheese (this will allow for more quick, even melting). Place the cheese in the prepared dish and bake for 8-10 minutes, or until cheese is almost completely melted. Meanwhile, chop 1/3 cup of the candied pecans. Remove the cheese from the oven and drizzle with warm caramel sauce. Sprinkle with candied pecans. 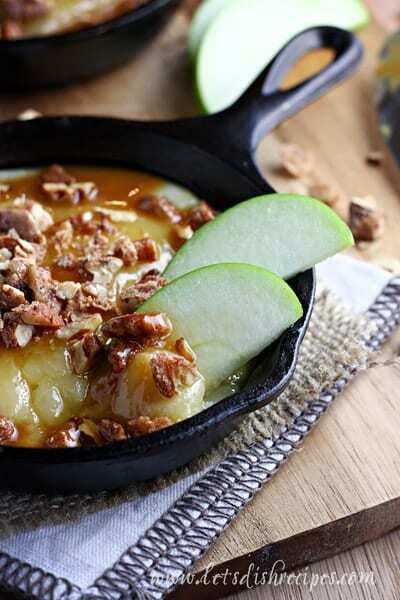 Serve immediately with tart apple wedges. Castello Havarti cheeses come in a variety of flavors, like Aged Havarti, Dill, Wild Garlic, Caraway, Jalapeño, and Herbs & Spices. And while some may not be the right choice for a cheese inspired dessert, they are all creamy, mild and delicious, with a soft, easy to slice consistency that makes them perfect for cooking and melting. 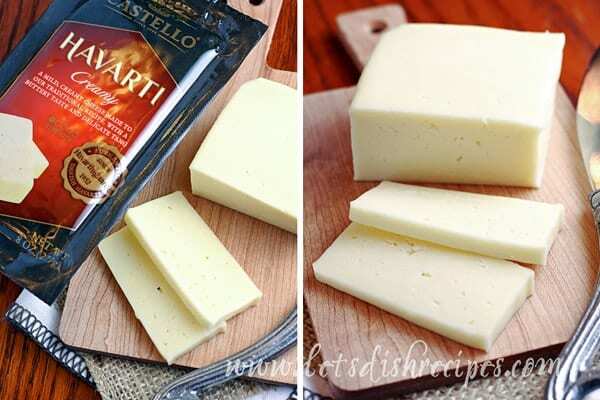 Whatever you’re cooking or baking, there’s sure to be a variety of Castello Havarti cheese will take your favorite recipes to a delicious new level. What a great idea. I’ve seen Havarti cheese in the supermarket and wondered what you could do with it. Now I know. Thank you Danelle. Hi Danelle! I have never used Havarti cheese in any recipies. This looks so good! Thanks Joanne! It’s really mild and creamy. I think it would go well with just about anything. I’ve never been much of a havarti fan when it’s by itself – but I think you have converted me here with this sweet harvarti dish! Looks SO delicious! I love Havarti, and this sounds like a wonderful appetizer. Will make this over spring break. Love your website.